Learn -- How to Put Contact Lenses In the Eyes. It is important that you put contact lenses in the eyes very carefully otherwise it can seriously damage your eyes. Wash Your Hands Thoroughly. Use good quality soap. Dry your hands with a clean towel. If it is possible avoid drying with toilet paper or tissue paper, it leaves traces on your hand. Make sure that all the soap has washed properly. Carefully Remove The Contact Lens From its Case. Make sure, whether it is for your right or left eye. It matters if you have different power numbers prescribed. Place the contact on your index finger of the hand you will be applying the contact with. You should use your dominant hand. Make sure that all the outside edges are face up and none are sticking to your finger. If the rim points out slightly instead of up, the lens is probably inside-out. Inspect lense for rips, tears, or debris. Rinse with lens solution if there is visible dust, etc. on the lens. 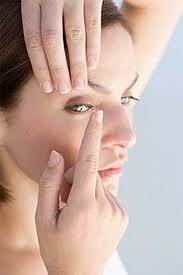 Use the index finger of your opposite hand to pull up your upper eyelid. 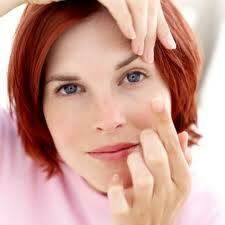 Use the middle finger of your dominant hand with the contact on it to pull your lower eyelid down. When you become experienced with this method, you will be able to do this by only pulling down your lower eyelid. Warnings: Never rinse your contacts in regular tap water- this will just make them dirty or drier than before. Tap water and even purified water contain bacteria.